It’s progressing!!! It’s beginning to look like something I like, even though it’s not yet half-dressed. Red glass beads, shoes collected from friends, chandelier crystals from my favorite junk shop. . .
Now it’s the fun stuff only, like decorating a Christmas tree. Which reminds me, I have some red and white carved wooden beads that were used a cople of times for Christmas tree garland. They would be perfect!!! Yeah, it might have benefitted from a few more coats of red paint. Yeah, it might be better to have taken it to a body shop where someone would shoot it with car laquer and then cure it with heat. Yeah, my artist friends would have made the shoe connections cleaner. All that aside, I LOVE it! My craft is ephemeral. I think about the origin of “lowering standards.” It’s an old battlefield expression, where the lowering of the lord’s standard on either side meant a signal to parley. It’s a great metaphor for allowing creative expression to enter before your skills are perfect. It’s how I become pleased enough with my craft, such as it is, to continue. Otherwise, I might never start. My piano playing is similar. It’s good enough for me. When I accept what I do as good enough, I break down the whispering rock inside that says I’m not. Can you hear it? Chip. Chip. Chip. P.S. You have one too! Chip. Chip. Chip. I can’t imagine a life without dogs, how too quiet, how too sad, how too lonely. Not to be greeted exuberantly even though you were only gone for 1/2 hour. A gaze that says all the power of the world must be yours to command. Even though the vacuum has to be cleaned after every use and the drool mopped up off the wood floors and the bed shared equally, 1/2 to the two humans and 1/2 to the dog. 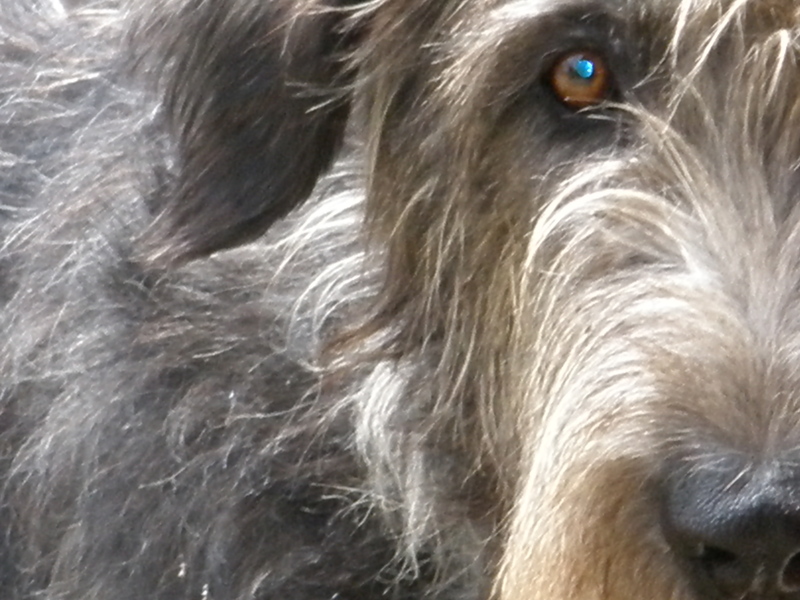 This is Fiona, a year and a half old Irish Wolfhound. When you first meet her, you can’t look at her. You have to stand very still until she comes up behind you and bumps your hand. Then you can pet her, but you still can’t look at her. She isn’t mine but I would love for us to be friends. Each time I visit I am able to get a little closer on my own. Would I work this hard to get to know a person who wasn’t sure about me? Probably not. Would you? 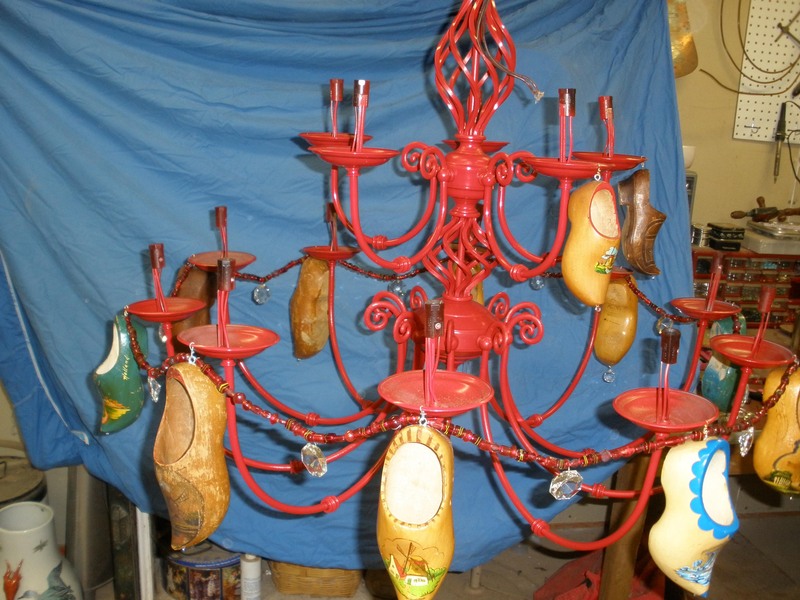 I’ve been looking for a way to make the old, tired chandelier that I found for $5 at a flea market work for 16, and now 18 wooden shoes. It wouldn’t. It wasn’t big enough. And, I had pulled all the old wires out of the arms before I read that you tape the new wires onto the old ones so that you can get them through. Sigh. It’s that read the instructions thingy again. And then a friend found this one at a Habitat Restore. It was new and tired, weary with a bronzey finish, but the bones were perfect! So he bought it. And then I painted it fire engine high gloss red, ’cause red truly is a neutral color. Those of you who don’t know that yet should spend some time there. You see it here, hanging under the front porch of the house. My spray painting digit is done for the day but already, I can tell it’s FABULOUS!!!! It’ll get one or two more touch up coats and then I’ll start on the dangles. Imagine it with wooden shoes, you know the ones? With assorted crystals hanging from the toes. And bands of red glass beads stretching across the dips in the arms. And maybe some maracas ’cause I might not have enough shoes for a piece this big. And speaking of this big, where do you think it’ll go? On a pulley under a large cedar elm outside. What? You’ve seen my house. Even if you haven’t, this sucker is BIG, like 3 x 3 feet. I can’t wait for the paint to dry. Thank you, Mellie, for this wonderful find! 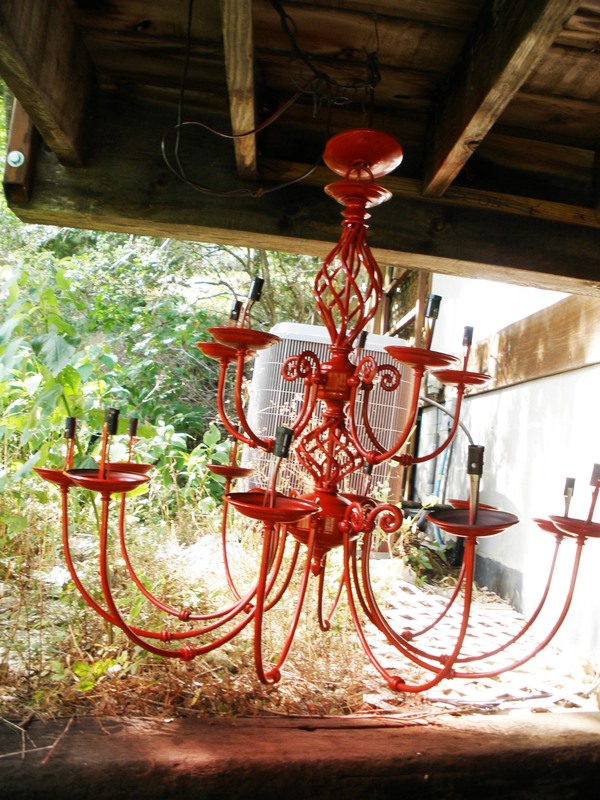 I don’t yet collect old chandelier frames, but I might one day. Keep your eyes open. 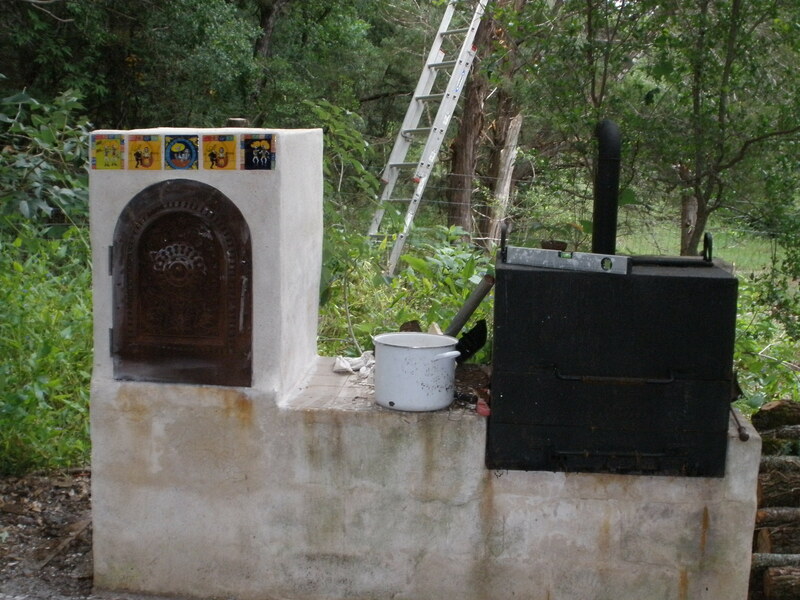 I found a set of plans for a wood-fired pizza oven in an old Sunset magazine several years ago. That was the start. It was built sort of out of sand or something and had a redwood door. You soaked the wooden door of the oven in a big tub of water for an hour or so and then fired up the oven. The theory was that the 900 degree heat wouldn’t burn the door up immediately. Yup. 900 degrees. We made a few adjustments to the plans, well, quite a few. We made it bigger than they said to, out of fire brick, with a base of concrete block. We had a Victorian cast-iron coal fireplace door for a decorative touch. And we added a fire pit to one side with an arm to hold a bean pot. We learned a few things. Bigger isn’t necessarily better, takes longer to heat up. The fire pit up in the air, with hot air rising doesn’t give you the oomph that a fire ring does. Essentially, your elbows get warm while your knees freeze. It takes 2-3 hours to come up to temp but when it does you can cook pizzas in series in about 4 minutes per. And they are truly the best pizzas ever. . . but talk about slow food. The crust is an adjustment on Alton Brown’s pizza crust. A favorite is asparagus, roasted red pepper and smoked salmon with alfredo sauce and of course, pepperoni with a red sauce. We live in South Texas, so there are about four times a year that this makes sense. Two of those times are when it’s too cold to hang out outside and eat that pizza, even with a fire pit. So, we filled the fire pit in with a barbecue made by Johnnie the Welder, as our friends refer to him. The man has never made anything light. Never. The box for the barbecue weighs about 300 pounds. He put pole handles on the top so that I could help lift it into place. He did is as a favor to me. Hmm. Gotta talk to that guy. I’ll tell you more about him later. He’s interesting. Most recently, we added a whole bunch of mass to the arched top with the idea that it would hold heat longer. So, the top is now square, not arched. And, of course, we added some Day of the Dead tiles on the top. Now we have to wait for one of those two times when it makes sense to use it . . . for those of you in other parts of the world, that’s sometime in January or February. For years, we subscribed to basic cable. . . well, okay, satellite ’cause there isn’t any cable that comes down this far to the end of our street. It was the only way to get reception for local channels down here in the bowl where we live, on the first terrace of a creek bottom. We watched a few network shows and the weather. I spent most of my time on Nick at Night and HGTV. And every few years, we’d drop the service because shows changed for the worse or we had seen everything that they had to offer. We watched about 4 hours a day and it was about $50/month for the little bit that we got. . . or if you roll it up. . . $600/year. One day, while we were in the off-again portion of our cable relationship, we hooked up an old fashioned antenna on top of the house. Surprise! We got the locally available networks and 5! count ’em 5! spanish language channels. TV without a charge. That was the death of cable/satellite for us. And then television went digital and we lost any reception that we had. But we had cut the cable by then and there wasn’t enough value to bring us back. While working schedules managed our days, television had been the clock by which we managed our nights. This program was on a 7:30 so dinner had to be ready by then; that program ended at 10:00 so we could begin to read, something we do every night before sleeping. The weather was on at 10:40 so we had to slog through the local news. In our area, that means hit and runs on pedestrians, shootings in clubs, etc. We always got the national and international news through NYT or NPR.It’s been 6 months. First we missed the noise of the television in our lives. Then we missed the local weather report, what was happening around us and what that meant. Now, we read the weather on the internet. It’s not as rich but it’s right as often. Last weekend people talked about their favorite funny commercials and I had no record, no image, no way to join in. It felt a lot like being a new anthropologist. TV’s dead but still moving in zombie fashion. The Pulse Network is taking on news. YouTube has taken on entertainment — sort of. What will the decentralized world of the web bring to the puzzle? More Dr. Horrible! Better scripts! Collected somehow and cataloged and sorted by what I say I like, like on StumbleUpon.